In the battle of high end apparel retailers, Nordstrom is really starting to separate itself from the pack. When looking at Nordstrom (NYSE:JWN), Bloomingdales, Saks Fifth Avenue (NYSE:SKS), and Neimen Marcus (NMG) from an online perspective, there really is no competition. Nordstrom recently revealed that they did $169 million in online business the second quarter of this year, a 15% increase from their 2Q 2007. Let’s take a look at how this compares to their competition. 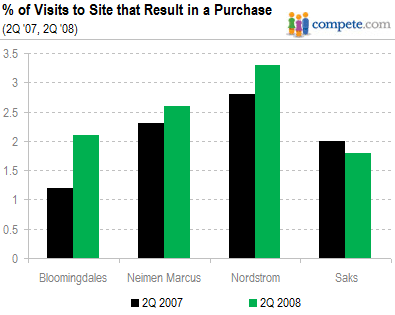 As a group, these four retailers have seen an increase in traffic to their websites from 2Q 2007 to 2Q 2008. Below is a chart showing the average number of unique visitors (UVs) per month for each retailer. You’ll notice both Bloomingdales and Saks doing a good job of generating more traffic, but still significantly trailing Nordstrom by over 1MM UVs per month. Of course, getting traffic to your site is only part of the equation. 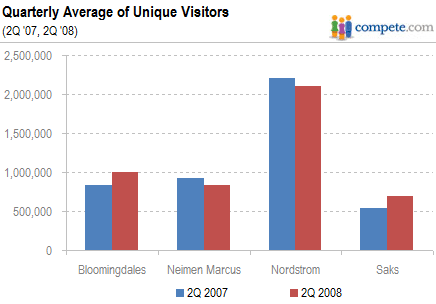 While Nordstrom.com saw their traffic take a slight dip 2Q 2008 compared to 2Q 2007, they are best in market at both keeping and engaging their visitors. In today’s world of instant information and gratification, consumers will decide quickly whether or not your online presence is one that resonates with them. With more and more people shopping online every year, it is not surprising to learn that all four retailers have seen an increase in their bounce rates. 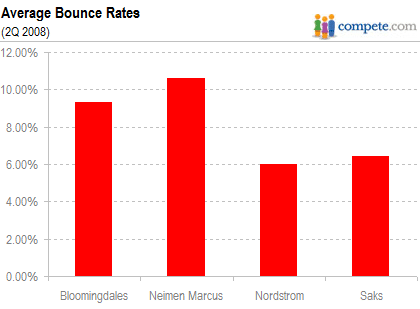 However, below is a chart showing the bounce rates of all four major retailers, and you will see Nordstrom.com with the lowest rate of all at 5.98%. Conversely, Niemenmarcus.com could probably impact sales greatly if they could figure out how to engage their consumers more quickly- Their bounce rate, the percent of visitors who arrive on the site and leave immediately, is a brow raising 10.61%, nearly twice as high as Nordstrom’s. This opens up a lot of questions, not the least of which would be around landing page effectiveness, and comparing the success of all the various online advertising campaigns… perhaps this could be fodder for another blog posting! What is really impressive is how loyal Nordstrom.com shoppers are and the rate at which these shoppers purchase online. 74% of shoppers to Nordstrom.com did not bother shopping at any of the other competitive web sites in the 2Q. Take the high loyalty rate, add a low bounce rate and you can begin to see how Nordstrom.com was able to pull $169 million out of their online channel. Below is a chart that shows conversion rates of the four main retailers for 2Q 2007 and 2Q 2008. Again, Nordstrom.com sets the bar. While Nordstrom.com is clearly the online leader in this segment, Bloomingdales.com shows a large increase in their conversions. Certainly there are several factors that play into this; one such factor could be that during the same time period in 2007 Bloomingdales.com received 1.77% of its traffic from coupon sites, and that traffic this year has nearly doubled to 3.27% of traffic. Perhaps Bloomingdale’s strategy around coupons is paying off? With holiday season approaching it will be interesting to see how well these sites are able to engage consumers, and the strategies they will use to do so (landing pages, coupons, etc. ).